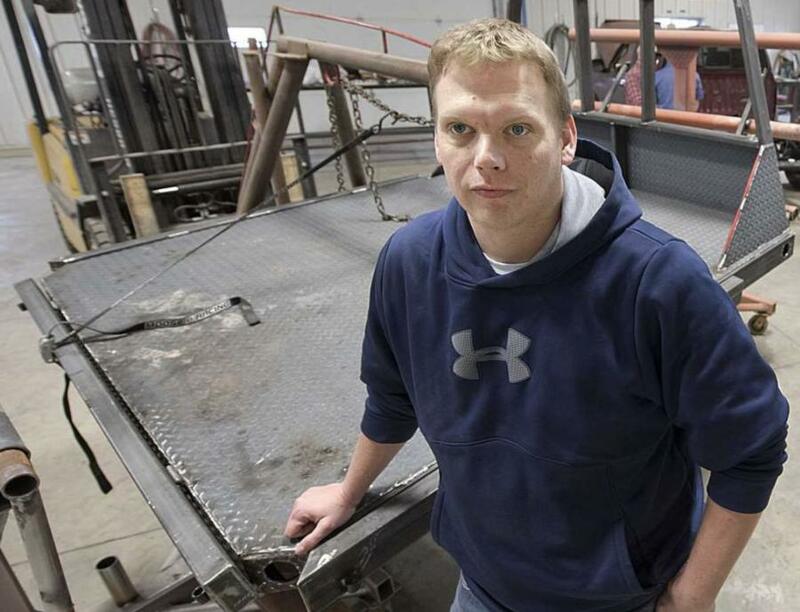 Randy Lee, a soldier who grew up in Soldier, Iowa, enjoys the challenge of directing his "troops" at American Coating & Welding, a small business he founded in Onawa in 2015. "Something like one out of every seven veterans starts their own business," said Lee, who served with the U.S. Army in Afghanistan in 2010-11. "We were deployed for duty overseas on my birthday, Oct. 28, 2010," said Lee, 35. "We came home on my next birthday." Lee, who served in an engineering company, helped construct buildings throughout Afghanistan during his tour of duty. The unit, he said, averaged constructing one facility every four days. "We re-did buildings after bombings," he said. "We faced mortar fire. It wasn't secure at all." Still, Lee said there were other soldiers and members of the Special Operations forces, for example, who served in more dire conditions. Unfortunately, the company Lee had worked for prior to his deployment closed while he was in Afghanistan. Lee returned home and learned he had no job to which he could return. "I was unemployed until I used the GI Bill to pay for my training to become a deputy," said Lee, a 2000 graduate of Boyer Valley High School and later a graduate of the University of Nebraska-Omaha. Lee signed on as a deputy with the Monona County Sheriff's Department and worked there until 2015, when he turned to his own company full-time. "This began in my garage, just me working for myself," said Lee, who also possesses a master's degree in human services. American Coating & Welding offers a range of powder coating, sand blasting, dustless blasting and welding and fabrication work, the Sioux City Journal (http://bit.ly/2pyLCRn ) reported. Lee and his three employees have tackled everything from classic cars and trucks to making flatbed units to redoing horse trailers. "We're also doing work for some Sioux City firms and area companies that build farm equipment," said Lee, who noted that the dirt work at his new shop site began in September 2015. The building, which measures 104 feet by 60 feet, is a Morton structure that was completed in January 2016. "At the start, I was out on the floor and we were working sunup to sundown," Lee said. "As time went on, I transitioned into the office more where I do the bookkeeping, sales, customer service and everything except the taxes. "There are learning curves in running the business, but I've had many great business owners give me advice," he said. Sen. Joni Ernst, an Iowa Republican and a veteran herself with overseas duty, visited American Coating & Welding to thank Lee for his service while congratulating him for running a successful start-up. "Joni Ernst wasn't just here as a senator, but as a veteran," Lee said. "She's very genuine." It is said that more than 10 percent of manufacturing businesses are owned by a veteran. As he walked through the shop, Lee pointed out a dozen or so doors hanging in the company's giant oven unit. Across the facility was the powder coating booth the employees and Lee assembled. After walking through a doorway, Lee greeted Ruben Yanak, his fabricator, and Mike Mathison, his father-in-law, as they worked to hook up wiring on a truck. "We are making a flatbed for a customer and we have to do the body work underneath," Lee explained. When asked about the selection of the name American, Lee paused and searched for the proper words to explain his choice. In many instances company founders often attach their surname to the firm, he said. "I guess I didn't feel comfortable having people work for me," he said. "Because when I'm gone someday, there might be someone else running the company." The American name, he added, suggested he and his employees are working for and serving more than a core group of people. In addition, the name and the U.S. flag he has as a background on his business card are a nod of sorts to the country he served while maturing as a leader during his tour of duty. "The military helped me with discipline," Lee said. "I learned there how to run a team, and how to deal with stress. To me, our military has the world's strongest training program." Plus, veterans like Andy Alexander, a former US Army Ranger, continue to support and give Lee any advice he seeks in getting American Coating & Welding off the ground.